Since opening his first gallery in the Minneapolis warehouse district’s Wyman Building in September 1984, dealer Todd Bockley has carved out an idiosyncratic and activist vision for art in the Twin Cities, one that is recognized not only by the local cultural complex, but also far beyond. His unique and personal purview on what art needs to see the light of day includes that by a dozen Native American artists, both living and dead, whose work finds consort with that of an equal number of other artists, a broad-based cache of work that is largely defined by a distinctive narrative stance or tinged with an untrained artist sensibility. Consequently, Bockley Gallery’s summer offering “Artists Singular: A Group Show” in his modest storefront space on the west side of Lake of the Isles, is more anticipated than unexpected. With eight works (really nine) by eight artists, “Singular” follows the art world tradition of summer shows being group shows that adhere to the Goldilocks principle — not too big, not too small, but just right. As such, “Singular” is a spirited mix of mostly untitled work both stylistically figurative and abstract, by Bruce Anderson, Frank Big Bear, Jim Denomie, George Morrison, Norval Morrisseau, Dietrich Sieling, Elizabeth Simonson and John Snyder. Sieling’s work just keeps getting better in his provocative synthesis of figurative form and abstract space. Working with marker on board, the artist has concocted an oblique narrative that is rooted in a personal karaoke experience, one that is riveting to observe. Multicolored abstract shapes, suggesting a disco ball’s reflected patterns of light, hover above, on and through mysterious figures in a spatially flat composition that is remarkable in its complexity. 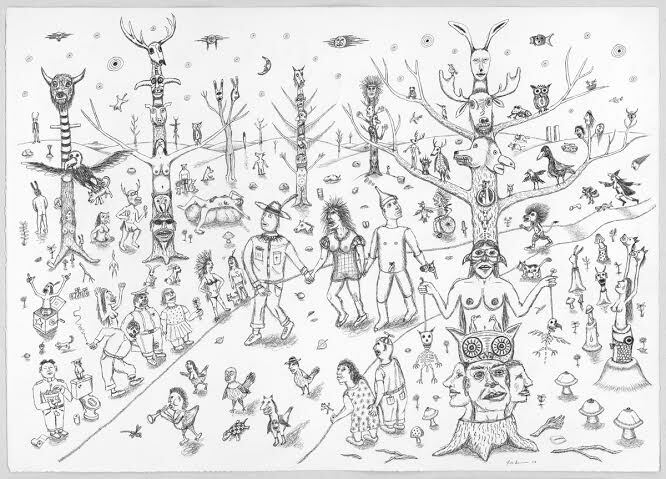 Jim Denomie’s untitled ink on paper drawing is a departure from his typically color-laden work. Combining Indian symbols and traditions with those of contemporary American culture as he typically does, Denomie’s bawdy narrative references the Wizard of Oz acted out by a rough-around-the-edges Kabala of creatures and characters. 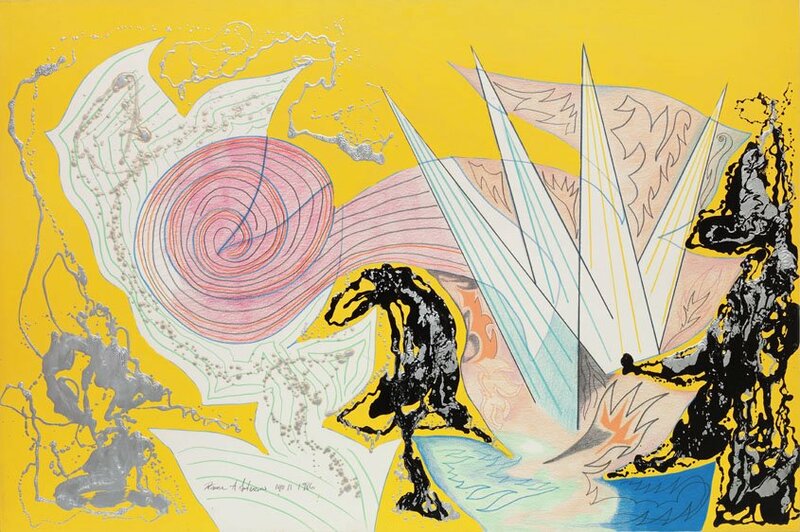 Unexpectedly there is a visual clarity to the work – which is not to suggest the narrative is easily understood – in its straightforward graphic presentation, a quality that not always defines his more vividly hued works. Frank Big Bear’s “Black Collage” is even more of a visual rout of the tensions between Indian and Pop American cultures. 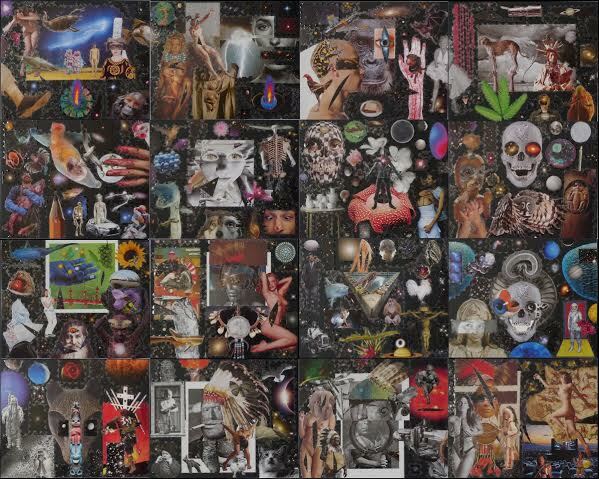 Comprising a grid of 16 panels of museum board that have been collaged with all manner of images culled from magazines and elsewhere, “Black Collage” is a visually exhausting and, ultimately, unfocused work. Images of Indians, animals, planets, religious icons, the night sky and totem poles, to identify only a few out of dozens, mingle with passages of abstract form and color, much of which is overlaid with triangular photo corners. While there are arresting narrative passages and clever references to contemporary art and culture, the preponderance of images of naked women, largely of the pinup variety, becomes a tiresome refrain to an otherwise potentially compelling song that ultimately deflates Black Collage’s overall impact. The late Anishinaabe artist, Norval Morrisseau (1932-2007) is well represented by the painting “Flower Arrangement.” Reflecting the Canadian artist’s signature style of painting abstracted but representational forms in saturated colors and outlined by thick black lines, the work depicts a potted spray of flowers inhabited by birds and butterflies, that seemingly float against an uninflected flat green ground. In its direct simplicity of form and fearless color it is a fine example of the “Woodlands School” or “Anishinaabe School” of Native art, which Morrisseau founded. John Snyder’s untitled sumi ink on paper drawing is a gem and virtually dances in its pictographic candor. Created in the limited palette of orange and black, a quasi-figurative form moves through a field of symbols and abstract forms in perfect compositional harmony. Representing the stylistically abstract camp are works by Bruce Anderson, George Morrison and Elizabeth Simonson. Seeing Anderson’s 1986 untitled color pencil on paper drawing was like bumping into an old friend. Widely exhibited at the time of its making, it is a sophisticated amalgam of undisciplined abstract form, Pollock-esque dribbles of black and silver enamel, all illuminated by a screaming yellow ground. (The biggest surprise is that this work is not part of someone’s collection after all these years.) An untitled Abstract Expressionist painting from 1963 represents the late George Morrison (1919-2000). Its explosive palette reminds us that Morrison was a true colorist. Much more restrained are the two modestly scaled gouaches on paper drawings by Elizabeth Simonson. Elegant in their monochromatic simplicity, the works depict swirling circular forms, one red and one black, that suggest subatomic particles in their movement and transparency. “Artist Singular: A Group Show” warrants a visit for anyone seeking a shot of art in the dog days of summer.